With Apple's new iOS 6 operating system being released to current model iPhone, iPad, and iPod touch owners, customers are eager to get the new update on their devices. But wireless carrier AT&T will be raining on some customer's parades tomorrow. iOS 6 is the software that allows the iPhone and iPad do all the amazing things we do with them. One of the new tent pole features of the software is FaceTime video calling over 3G and 4G cellular networks. 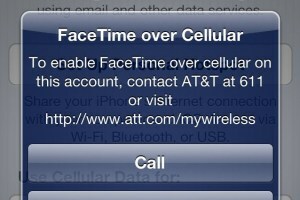 Up until now, it has only been possible to make a FaceTime call over a Wi-Fi connection and iOS 6 aims to change that. However, AT&T has stated that they will only allow customers who sign up for their new Mobile Share plans will be allowed to place FaceTime calls on their cellular networks. While customers have been crying foul, AT&T has been trying to limit the congestion on their 3G and 4G LTE networks that caused so much bad press for them with earlier iPhone models, most notably, the 2010 iPhone 4. When you look at the Mobile Share plans, AT&T tells you that you can have up to 10 devices included on a single share plan. Then you look at the pricing structure and the sticker shock sets in. For unlimited, traditional voice calling and text messaging plus 1GB of shared data, you will have to spend $40/mo for the service plus and additional $45/mo for each smartphone participating in the plan. For 4GB of data, the price jumps up to $70/mo plus $40/mo for each smartphone. AT&T is also offering shared data packages in 6GB, 10GB, 15GB, and a 20GB pool. The larger the pool of shared data, the larger the base monthly fee is, but the monthly cost per smartphone drops. As you can see, the monthly totals can add up quickly if you are trying to share a pool of data amongst family members. And that's why Free Press, Public Knowledge, and the New America Foundation's Open Technology Institute have banned together to file a complaint with the Federal Communications Commission. The trio feel that it is unfair for customers to have to buy into a shared data plan like AT&T's Mobile Share plans just to be able to make a FaceTime call over a cellular network. While they did provide AT&T with notice of the impending filing, at least publicly, no date has been given as to when the filing will be made. Customers looking to sign a new service agreement with AT&T do have other options. Sprint, for example, will be allowing customers who have signed up for their Simply Everything plans ranging from $79.99 - $109.99/month to make FaceTime calls on their network. Verizon Wireless' Simplify with Share Everything 4GB share package offers similar features to that of Sprint's, but will run you about $150/mo when sharing data across two smartphones.